DrChopSuey really does knit! I've been a little busy with that whole work thing. I have a couple 1/2-completed posts (including one on my Amsterdam fiber buys) but for now I have a number of projects completed and ready for blog posting! 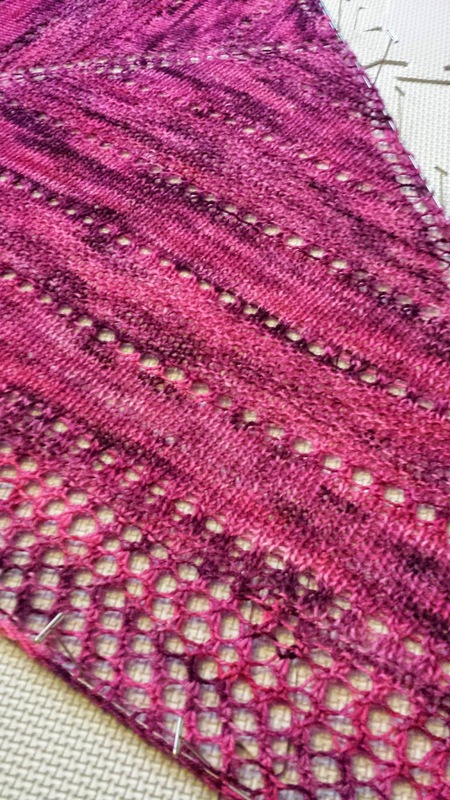 Back in April I went on a trip and started this shawl. 7+ hours on the plane meant I almost finished it! However, when I got home I looked at it and noticed it was a mess. I knit the first stitch rather than slipping, and I used size 7 needles so the stitches/fabric were really big and loose. So... I ripped it all out. A couple months later I picked it up again, this time with size 6 needles and decided to change up the pattern. And now, I must say, I'm very happy with the results! This was a perfect travel knit. On the plane, bus, metro, car... 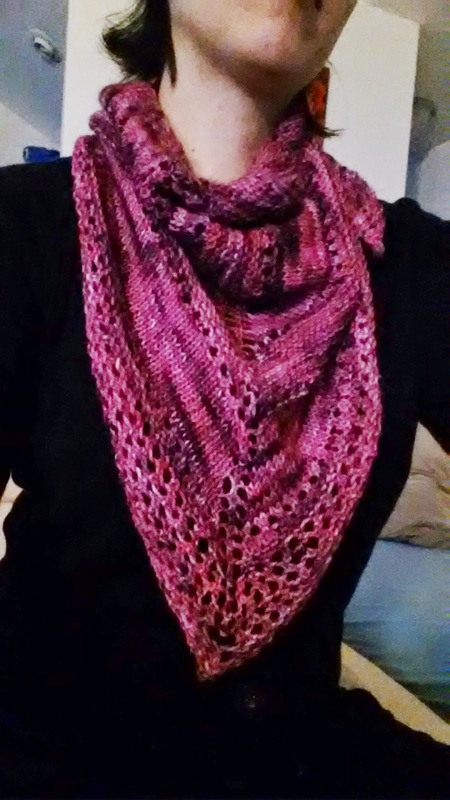 I knit this project all the time! Because the pattern repeats were so easy to memorize I could easily throw this into my purse/bag and pull it out even if I only had 5 minutes of knitting time. Easy enough to ball up and throw back into the purse when done (or at my metro stop). I did change the pattern a bit. 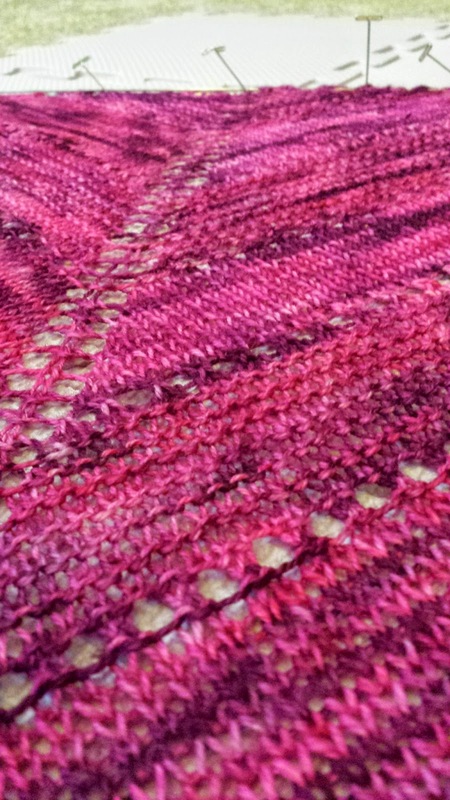 Instead of a garter stitch shawl, I opted for a different sort of texture shawl. 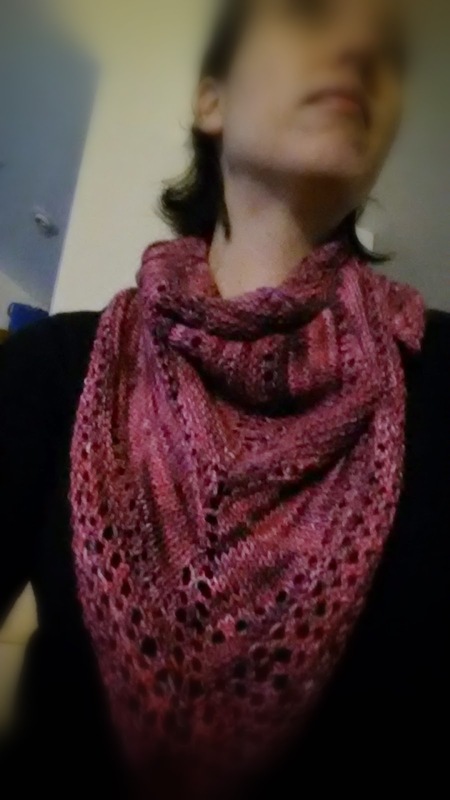 I alternated between garter and stockinette stitch on the pattern repeats. In other words, I started the first pattern repeat in garter (knit on both sides) as the pattern calls. But on the second pattern repeat I switched to stockinette stitch (knit on one side, purl on the other). And I did ssk for my decrease on the purl side. Actually I only did this because of the way I knit. Because I'm a combination knitter (western knits and eastern purls) it was easier (and faster) to maintain the K2tog on the stockinette section. This made my decreases on the garter sections slant to the right and on the stockinette section slant to the left. So... if you are a "regular" western European or American knitter, K2tog on the garter section and ssk on the stockinette section. As for the yarn... me like! This sock yarn is typical of what I like to knit with (for socks), 80% merino wool and 20% nylon blend. But the hand-dyed yarn was just too pretty for socks! 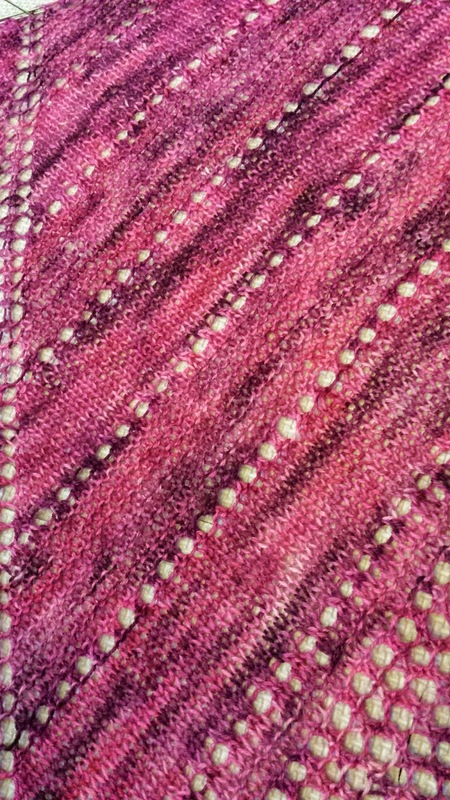 I really like the variegated light and dark pinks of the yarn. Yes I know, this made the texture of the garter vs stockinette stitch not as apparent from afar. But I can tell by feel - and that's what I wanted. This hank of yarn was an awesome bang for the buck! At 450 yards per hank, I still have some leftover for another small project. I purchased the yarn during one of my travels to the pacific northwest a couple years ago so it reminds me of visiting and spending time with my friends out there. Always a nice added bonus to projects that become wardrobe staples. Hi. I saw that you said in your first shawl that you made you didn't slip the first stitch that you knit it. 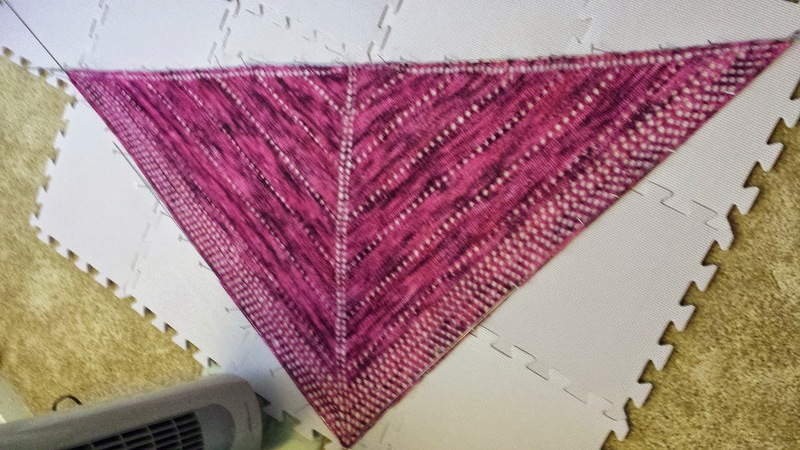 I'm doing this pretty basic shawl and I don't see where it says to slip the first stitch. Hi Kimberly (I hope you get this!). The pattern does NOT say to slip the first stitch. But when you knit the first and last stitch you get the typical garter stitch "nubin" edge. I wanted a little more detailed edge. So I just slipped the first stitch (I believe as if to purl) on every row.